This week our clients received an Evidex Alert summarizing the signals and providing context with data taken directly from the Evidex platform. Out of the 19 new safety signals discussed in the FDA's release, seven have already been resolved with label changes and 2 were resolved without any action by FDA, with the Agency concluding that it was not necessary to adjust the labels. One of the 10 outstanding signals remaining is for the adverse event rhabdomyolysis being associated with the dipeptidyl peptidase-4 inhibitor (DPP-4) class of drugs. In this blog post, we explore this signal in more depth using the data and analytics found in Evidex. 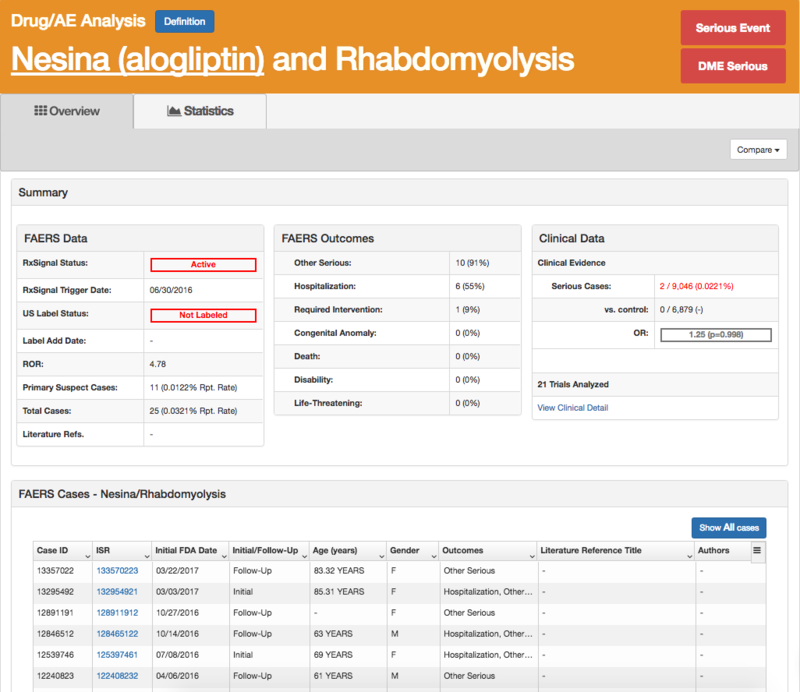 Below is a screenshot from Evidex showing the reporting odds ratios (ROR) for the Standardized MedDRA Query (SMQ) rhabdomyolysis/myopathy. You can see that some, but not all of the drugs have an elevated ROR. Since Nesina has the highest ROR of the group, let's take a look specifically at the data for Nesina and Rhabdomyolysis. The screen shot below shows all of the Active and Watchlist RxSignals for Nesina. 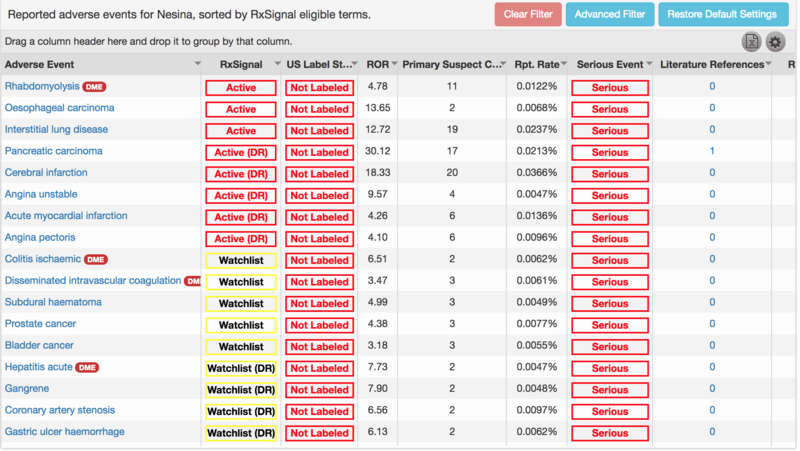 As a reminder, RxSignal is Advera Health's proprietary signaling algorithm that predicts FDA action with 74% accuracy. You can learn more in the Drug Safety manuscript that was published in the March 2016 issue. Clicking on the rhabdomyolysis MedDRA Preferred Term (PT) brings us to a more detailed analysis. You can see that the Active RxSignal was triggered in June of 2016, 3 quarters prior to FDA signal. Individual safety case reports (ISCR) can be seen and accessed at the bottom of the page. 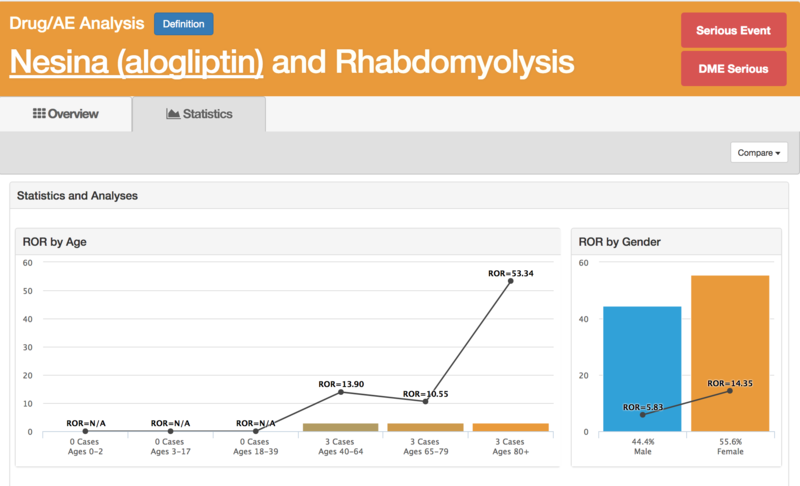 You can also see that clinical data is being displayed in the upper right of the screen. Combing through all of Nesina's clinical trial data that has been published, the Advera analysts have found 2 serious cases of rhabdomyolysis. A pooled-analysis calculation shows an odds ratio (OR) of 1.25, but it does not achieve statistical significance with a p-value of 0.998. Moving to the statistics tab allows for an age and gender stratification analysis as seen below. 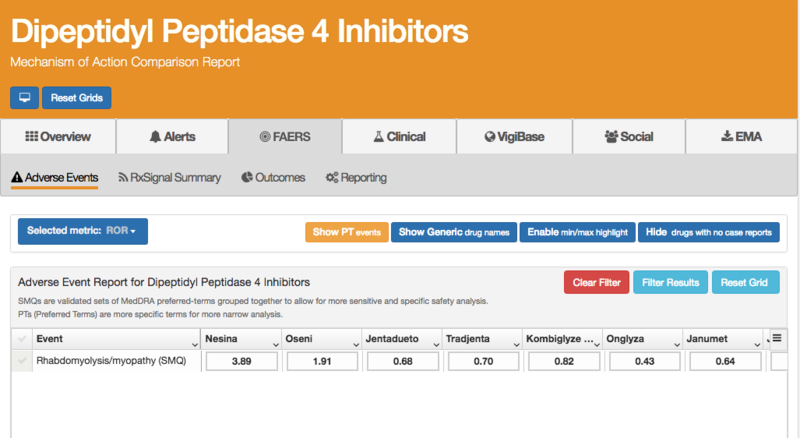 Using the Custom Drug-Adverse Event Analysis tool, a user can take the same approaches as seen above, but combine all of the DPP-4's together as a class for analysis. You can see in the screen shot below that we are conducting an OR search with all of the DPP-4's as a primary suspect. With 135 distinct cases and a combined ROR of 1.06, you can see why FDA is looking at this more closely. When looking at a pooled analysis of 200 clinical trials using the entire class of drugs, you can see that the OR drops below 1, but again without statistical significance. When validating a safety signal, it is important to look at multiple data sources to get all "versions of the truth". 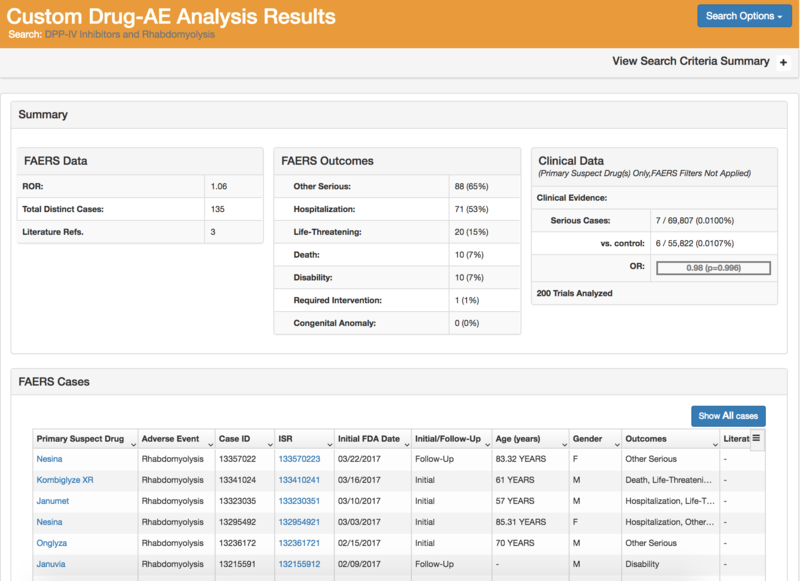 In this analysis, we used FAERS and Advera's Clinical Evidence database to get started. The next logical steps would be to expand this analysis to include global data using VigiBase, social media data from Booz Allen Hamilton's Epidemico, as well as an analysis in a multi-payer claims dataset. Which all can be done quickly and efficiently in Evidex.